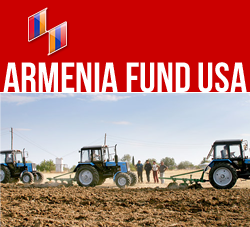 NEW YORK, New York — On March 30, Armenia Fund held the concluding round of the President’s Youth Prize competitions, the fine-arts and film competition. The exhibition, which featured the works of 19 finalists and gave jurors the opportunity to make their final selections, took place at the main gallery of the Artists’ Union of Armenia, in Yerevan. Commenting on the general quality of the paintings, sculptures, graphics works, photographs, and films displayed at the exhibition, jury members were unanimous in their judgment that this year’s entries represented an unprecedented level of originality and sophistication. Haik Poghossyan, a sculpture finalist, noted that such competitions help emerging artists earn experience and added confidence. Another finalist, Meline Saftalyan, whose vibrant animated films were audience favorites, spoke of the hard work which has enabled her to make it to the final round of the competition. Armenia Fund has also concluded the final rounds of the President’s Youth Prize competitions in the categories of classical music and literature. Winners of the President’s Prize — as those of the President’s Youth Prize in the categories of classical music, literature, fine arts, and film — will be announced during an awards ceremony to be held at the presidential palace on May 13.